Héctor Zamora constructs artworks with local, utilitarian materials. 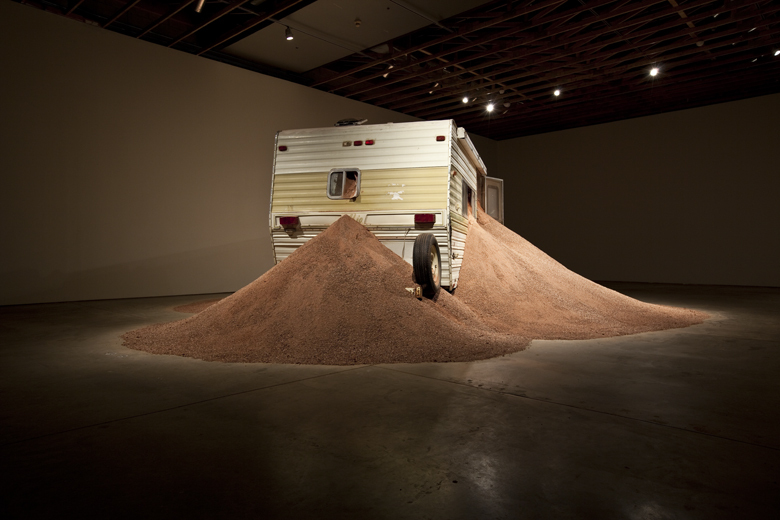 Here, a heavily used 18-foot-long trailer groans under the weight of 30 tons of rock filling its interior and spilling out the windows into massive piles on the floor. The objects in this work tell a story. The native rock was mined immediately outside Phoenix and thus has ties to the labor and local economy. The trailer was the primary residence of a man who was saving to get an apartment. Objects abandoned inside it are clues to his life: flip flops, sports equipment, the title to the trailer that documents his move from California. Zamora honors those histories, presenting the materials as simply as possible. 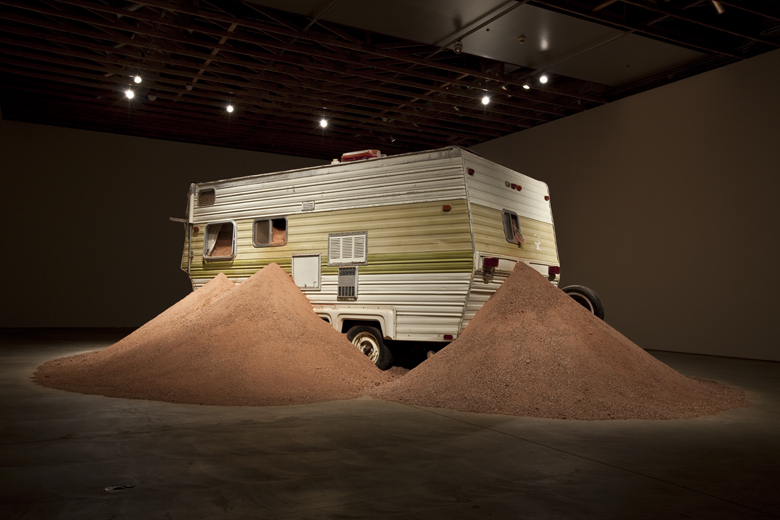 During Zamora’™s 2011 research trip to Arizona, the artist studied the local effects of the economic recession and the residential housing collapse. He explored tract-home communities abandoned mid-construction; mobile homes and trailers squatting on vast stretches of rural land; and the Salt River Pima-Maricopa Indian reservation, tribally owned land a five-minute drive from the museum’™s front door. In every direction the single-family dwelling’”’the American dream’’”appeared threatened. The aftershocks of poverty left houses abandoned and communities dissolved. Zamora perceived the home’”a metaphor for family, a healthy economy and cultural values’”in crisis. 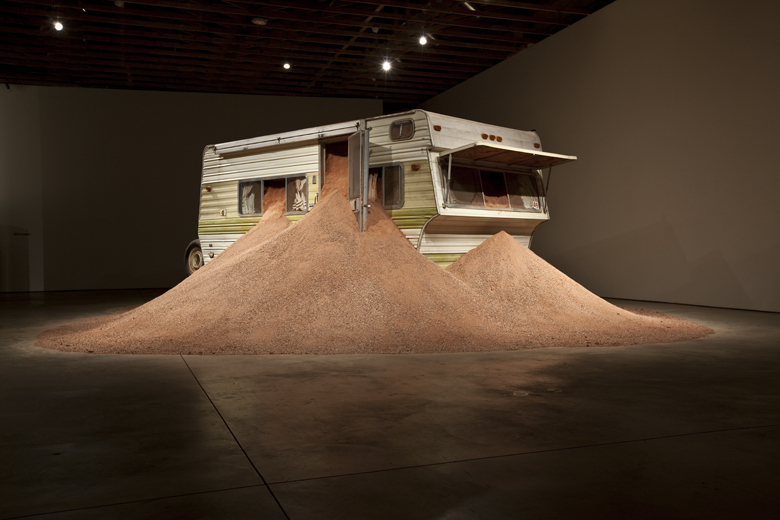 In the work Zamora made in response, the trailer disgorges fragmented rock and sand, almost burying itself under the weight of its own disintegration. Reductio Ad Absurdum is a monument to the turbulence, but also the absurdity, of our times.